It takes longer time for residents from these residential areas to travel in these suburban districts. Meanwhile, all members of his family have to “enjoy specialties such as traffic congestions” every morning and evening. Tu said the two bridges of Nguyen Van Cu and Kenh Te connecting his home to his office in district 5 are overloaded and he has to depart from his home at 6 a.m every morning because he would not like to be trapped in traffic jams on the roads for 30 minutes. “We were haunted with travelling on these roads every day,” said Tu. According to a report on Nguoi Lao Dong (Labourer) newspaper, on the morning of April 5, hundreds of cars and motorcyles were jammed on the Nguyen Huu Tho Street in district 7, struggling to reach Kenh Te bridge. Construction of a number of residential areas and apartment buildings in districts 7 and Nha Be are blamed to the traffic problems in the area. Along a section of Nguyen Huu Tho street bordering Nha Be district, over ten apartment buildings and tenements were erected, and are populated with over 10,000 residents. “As soon as we leave our homes, we encounter traffic problems,” said Tu. Residents from other districts also face traffic jams. It takes residents from the suburban district of Hoc Mon, which is 19km apart from the centre of district 1, from 60 minutes to 70 minutes to travel from their homes to offices (in district 1), because the two major roads in the district – Truong Chinh and Quang Trung streets – are encountering frequent traffic jams. An ex-official of the Hoc Mon district authority said despite the rising number of immigrants from other localities coming to Hoc Mon, no new road was built in Hoc Mon district in the past decade, causing more and more serious traffic problems to the district. The increasing number of labourers from districts 2, 9 and Thu Duc seeking jobs in the inner districts of HCM City every day has added fuel to the fire, causing frequent traffic jams on Hanoi Highway, Mai Chi Tho Boulevard, Thu Thiem bridge and Thu Thiem underground tunnel. In addition, the operation of apartments, office buildings, and business centres in the inner districts have also made the situation even worse. According to reports from the Binh Chanh District People’s Committee, the district has faced under-developed infrastructure development. The rising number of migrants re-settling in Hoc Mon every year has increased the number of means of transportation in the district. However, inadequate investment in infrastructure development has caused environmental problems such as traffic jams, flooding, and air pollution. 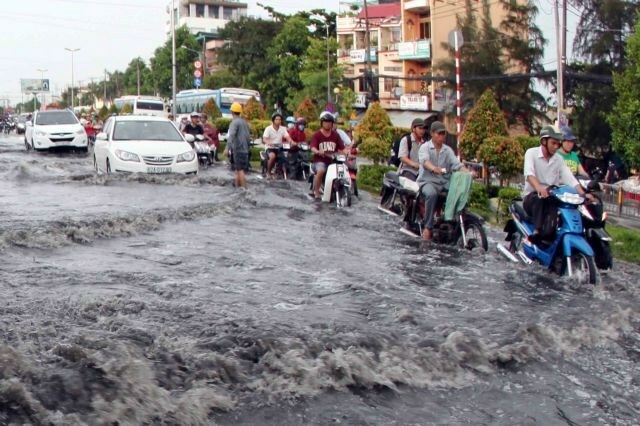 Huynh Van Thanh, head of Binh Chanh District’s Urban Management Division, said Binh Chanh has over 1,000 roads but over half of them do not have other infrastructure facilities, such as pavements, and lighting systems. Many of them have as yet been asphalted. To travel in Hoc Mon or to other districts, Hoc Mon residents have to use highways such as the National Highway No 1A, the National Highway No 50, and the provincial Road No 10. According to the management of the Thu Thiem underground tunnels, the establishing of urban areas in the eastern districts of HCM City has helped attract a large number of residents to these districts. But construction of bridges spanning Sai Gon river such as Thu Thiem bridges No 2, 3 and 4 have yet completed, causing frequent traffic congestions in these suburban districts. Architect Vo Kim Cuong from HCM City said infrastructure in Vietnam is different from the situations in other countries over the world, and the inappropriate infrastructure development is one of the reasons behind the overload of the infrastructure facilities in HCM City. Instead of infrastructure development first, before the construction of houses and other accommodations. Relevant authorities have given permission for building houses and accommodation before developing infrastructure facilities. Construction of the city’s beltways has as yet be completed, and residents of the districts in Sai Gon South who want to travel to the northern districts have to travel through the city’s centre. Inadequate infrastructure development and the rising number of traffic are reasons behind the traffic problems facing the urban districts of HCM City, said Cuong.